It happens sometimes: we begin orthodontic treatment, and life takes us to a new destination. Changing orthodontists mid-treatment can be tricky. You have all this stuff in your mouth, and somebody has to take care of it! Here are a few suggestions to make things easier for everyone. 1. 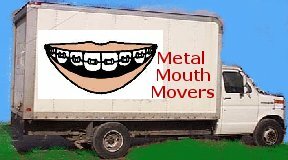 If you are planning to move, or even if it is a mere possibility, tell your orthodontist ASAP. Most orthodontists work on a "pay as you go" plan. In other words, you pay a certain amount of money at the outset of treatment (for the molds, consultations, and having the braces installed). Then, each month, you pay a percentage of the rest of your balance. So, if you move away from your orthodontist, be sure to tell him/her ASAP so that you will not be charged extra. You orthodontist will probably "pro-rate" your balance or refund some of your money. Be sure to ask what your doc's policy is in this situation! Request your dental records and x-rays, or ask your orthodontist to forward them to your new orthodontist once you arrive at your new location. 3. Try to identify a new orthodontist before you move, if possible. 4. Get them talking to each other. Orthodontists vary in their treatment approaches. Ask your "former" ortho to call your "new" ortho and talk about your treatment plan. This way, you know that your "new" ortho is continuing your original treatment plan -- or not. 5. Don't be surprised if you need to spend more money. You may wind up paying a few hundred dollars more to your new orthodontist. After all, this new doc has never seen you before, and you are a new patient to him. Hopefully, changing orthodontists mid-treatment won't raise your treatment costs too much. Will my treatment cost more? If so, how much? How do you bill your patients? Are you going to continue my previous orthodontist's treatment plan, or do you have other ideas for my treatment? Will my treatment take the same amount of time (will my braces come off when I had expected them to originally)? What are your office hours? What is your procedure if I have a poking wire? I have "XYZ"-type braces. Can you continue my treatment with them? Here's a great scenario: you take a new job and move. Your new job offers orthodontic benefits! But wait -- did you know that most orthodontic benefits are for new treatment, not for existing treatment? So, no matter how wonderful those orthodontic benefits are, chances are you won't be able to use them. Be sure to look into this! Also, if you're on a dental plan that offers a list, call and ask if they have any orthodontists in your new area. Maybe they do! It's not a good idea to pay for your entire treatment up-front. Most orthodontists have a "make a deposit, then pay-as-you-go" plan. Why don't you want to pay up-front? Several reasons: what if you move again? What if you decide to change orthodontists again? And....unlikely, but....what if your orthodontist is unscrupulous? Yes, there are true stories about dentists who took full payment from their patients -- and then closed their practices! Some of their patients had to pay the full amount (in excess of $5,000) again to the new orthodontist, and some just couldn't afford the unexpected expense and had to stop their treatment. Don't let this happen to you!